Bread has a significance beyond mere nutrition in many cultures in the Western world and Greater Middle East because of its history and contemporary importance. Bread is also significant in Christianity as one of the elements (alongside wine) of the Eucharist; see sacramental bread. The word companion comes from Latin com- "with" + panis "bread". The political significance of bread is considerable. In 19th century Britain, the inflated price of bread due to the Corn Laws caused major political and social divisions, and was central to debates over free trade versus protectionism. The Assize of Bread and Ale in the 13th century demonstrated the importance of bread in medieval times by setting heavy punishments for short-changing bakers, and bread appeared in the Magna Carta a half-century earlier. Like other foods, choosing the "right" kind of bread is used as a social signal, to let others know, for example, that the person buying expensive bread is financially secure, or the person buying whatever type of bread that the current fashions deem most healthful is a health-conscious consumer. As a simple, cheap, and adaptable type of food, bread is often used as a synecdoche for food in general in some languages and dialects, such as Greek and Punjabi. There are many variations on the basic recipe of bread worldwide, such as bagels, baguettes, biscuits, bocadillo, brioche, chapatis, Challah, lavash, naan, pitas, pizza, pretzels, puris, tortillas, and many others. There are various types of traditional "cheese breads" in many countries, including Brazil, Colombia, Italy, and Russia. 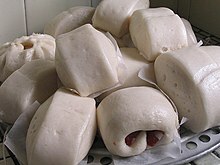 The traditional bread in China is mantou. It is made by steaming or deep-frying dough made from wheat flour. In Northern China and northern central China, mantou is often eaten as an alternative staple to rice. Steamed mantou is similar to Western white bread, but since it is not baked it does not have a brown outer crust. Mantou that have a filling such as meat or vegetables (cha siu bao, for example) are called baozi. The kompyang of Fuzhou is an example of a Chinese bread baked in a clay oven. Aloo paratha served with butter, from India. In the Indian subcontinent, chapati or roti, types of unleavened flatbreads usually made from whole-wheat flour or sometimes refined wheat flour and baked on a hot iron griddle called a tava, form the mainstay of the people's diet. The chapati, as it became known, is an unleavened bread with a long tradition. The bread can be spelled Chapathi, Chapatti, or Chappati. Rotis and naans are usually served with curry throughout the region. 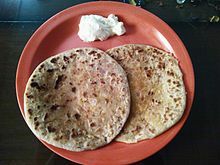 A variant called makki di roti uses maize flour rather than white flour. Another variant is puri, a thin flat bread that is fried rather than baked and puffs up while cooked. Paratha is another variation on roti. Naan (leavened wholewheat bread) is baked in a tandoor or clay oven and is rarely prepared at home. White and brown breads are also very common, but not as common as roti. In the Philippines, pandesal (or pan de sal, meaning bread of salt or salt bread) is a rounded bread usually eaten by Filipinos during breakfast. The Philippines also produces a cheap generic white bread called Pinoy Tasty. An enormous variety of bread is available across Europe. Germany alone lays claim to over 1300 basic varieties of breads, rolls, and pastries, as well as having the largest consumption of bread per capita worldwide. Bread and salt is a welcome greeting ceremony in many central and eastern European cultures. During important occasions when guests arrive, they are offered a loaf of bread with a salt holder to represent hospitality. In France, there has been a huge decline in the baguette culture. In the 1970s, French people were consuming an average of one loaf of bread per day. Only a century ago, the French ate approximately 3 loaves of bread per day. Today, French people eat only a half a loaf of bread per day. In response to this decline, bakers have created a national campaign to get people to call at the bakery before and after work just as they used to. The campaign models the American "Got Milk?" campaign, plastering "Hey there, have you picked up the bread?" all over billboards and bread bags. During the 18th century, the moral economy of France was based on wheaten bread. By supplying a sufficient amount of bread to the people, the government was able to demonstrate its strong political fitness. Wheaten bread was also thought to be indispensable to one's well-being after French medical chemists had associated gluten with several nourishing elements in plants. As bread had a high gluten content compared to other cereals, it was given a reputation of being the alimentary ideal. Consequently, consumers became extremely concerned with the quality of their wheaten bread, resulting in a meticulous surveillance of wheaten bread production; they did not want their bread to contain filler additives such as bran, rye, barley, and legume flour. At the time, bread was the most sought out food as it was considered to be essential, universal, and highly nutritive. It was typical for the average French citizen to believe that it was impossible to overindulge in bread. For many, bread became the centerpiece of every meal. All other foods such as fruits, vegetables, and meats were thought as subsidiary, or ancillary to nourishment. There is a wide variety of traditional breads in Great Britain, often baked in a rectangular tin form. Round loaves are also produced, such as the North East England specialty called a stottie cake. A cob is a small round loaf. A cottage loaf is made of two balls of dough, one on top of the other, to form a figure-of-eight shape. There are many variations on bread rolls, such as baps, barms, breadcakes and so on. The Chorleywood process for mass-producing bread was developed in England in the 1960s before spreading worldwide. Mass-produced sliced white bread brands such as Wonderloaf and Mother's Pride have been criticized on grounds of poor nutritional value and taste of the loaves produced. In Spain, bread is called pan. The traditional Spanish pan is a long loaf of bread, similar to the French baguette but wider. One can buy it freshly made every morning in the traditional bakeries, where there is a large assortment of bread. A smaller version is known as bocadillo, an iconic piece of the Hispanic cuisine. In Spain, especially in the Mediterranean area, there have been guilds of bakers for over 750 years. The bakers guild in Barcelona was founded in 1200 AD. There is a region called Tierra del Pan ("Land of the Bread"), located in the province of Zamora, where economy was in the past joined to this activity. According to Guinness World Records, Turkey has the largest per capita consumption of bread in the world as of 2000, with 199.6 kg (440 lb) per person; Turkey is followed in bread consumption by Serbia and Montenegro with 135 kg (297 lb 9.9 oz), and Bulgaria with 133.1 kg (293 lb 6.9 oz). Flat breads of many flours are a widespread along Latin America, the most common probably being sopaipillas. Chile is the second bread consumer worldwide. Corn tortillas are the staple bread in most of Mexico, bread rolls in many varieties are an important daily food for city dwellers. Popular breads in Mexico include the bolillo roll and pan dulce. Pan dulce, which is Spanish for "sweet bread", is eaten in the evenings with hot drinks like traditional hot chocolate. Chapati breads are common in the Caribbean Islands and Guiana. In Peru, bread has many variations due to the diversity of Peruvian cuisine. People usually eat pan de piso and pan serrano. There are also some kinds of bread made of potatoes; these are currently popular in the Andes. Bizcochos are sweet bread usually eaten with some butter and hot chocolate. A dough made with cooked pumpkin or squash, often shaped and fried into doughnuts and served with a sweet fruity dipping sauce, is a traditional favorite. Bread is an ingredient of sopas de ajo, gazpacho, and salmorejo. In Venezuela and Colombia arepa is a common type of bread made with corn flour, arepas are usually filled for making diverse sandwiches. Arepa de huevo is type of arepa from the Pacific coast of Colombia. Many breads in Paraguay, Brazil and Northeast of Argentina are made with flour and cheese, like chipa, sopa paraguaya and pão de queijo. In the Rio de la Plata region sopaipillas are called torta frita and are fried in cow fat, other type of bread that is commonly found is galleta de campaña, a grease dough made of layers, roscas are a type of bread in Uruguay that is commonly eaten on semana santa (Easter), they are usually filled either with chicharrones or quince cheese. Pan de miga is a bread that is specially made for making sandwiches de miga and mostly is not consumed on another way, same as pebetes that are commonly filled with ham and cheese. A type of croissant commonly found in Rio de la plata is Medialuna. Meal consisting of injera and several kinds of wat or tsebhi (stew) or (maraq), typical of Ethiopian cuisine, Eritrean cuisine and Somali cuisine. In the Horn of Africa, notably Ethiopia and Eritrea, a bread called injera is made from a grain called teff. This is a wide, flat, circular bread that is in a similar shape of a tortilla and is also used as a utensil to pick up food. Also consumed is a thick and chewy fried bread that is smothered in oil beforehand. The rghifa bread is a staple in the food of Morocco and consists of several layers of lightly cooked bread. In Egypt, bread is called aysh (aish merahrah or aish baladi) and the ancient proverb has it that "life without aysh is not life". The typical Egyptian bread is circular, about 6 inches across, often baked in small neighbourhood bakeries and bought still warm. Traditional breads in the United States include cornbreads and various quick breads, such as biscuits. Rolls, made from wheat flour and yeast, are another popular and traditional bread, eaten with the dinner meal. Cornbread is made from cornmeal and can differ significantly in taste and texture from region to region. In general, the South prefers white cornmeal with little to no wheat flour or sweeteners added; it is traditionally baked in a cast-iron skillet and ideally has a crunchy outside and moist inside. The North usually prefers yellow cornmeal with sometimes as much as half wheat flour in its composition, as well as sugar, honey, or maple syrup. This results in a bread that is softer and sweeter than its southern counterpart. Wheat flour was not available to the average North American family until the early 1900s when a new breed of wheat termed Marquis was produced. This was a hybrid of Red Fife and Hard red winter wheat. Marquis grew well and soon average Americans were able to have homemade wheat bread on the table. Homemade wheat breads are made in a rectangular tin similar to those in the United Kingdom. Spoon bread, also called batter bread or egg bread, is made of cornmeal with or without added rice and hominy, and is mixed with milk, eggs, shortening and leavening to such a consistency that it must be served from the baking dish with a spoon. This is popular chiefly in the South. Sourdough biscuits are traditional "cowboy food" in the West. The San Francisco Bay Area is known for its crusty sourdough. Up until the 20th century (and even later in certain regions), any flour other than cornmeal was considered a luxury; this would explain the greater variety in cornbread types compared to that of wheat breads. In terms of commercial manufacture, the most popular bread has been a soft-textured type with a thin crust that is usually made with milk and is slightly sweet; this is the type that is generally sold ready-sliced in packages. It is usually eaten with the crust, but some eaters or preparers may remove the crust due to a personal preference or style of serving, as with finger sandwiches served with afternoon tea. Some of the softest bread, including Wonder Bread, is referred to as "balloon bread". Though white "sandwich bread" is the most popular, Americans are trending toward more artisanal breads. Different regions of the country feature certain ethnic bread varieties including the Ashkenazi Jewish bagel, the French baguette, the Italian-style scali bread made in New England, Jewish rye, commonly associated with delicatessen cuisine, and Native American frybread (a product of hardship, developed during the Indian resettlements of the 19th century). The Eucharist (also called Holy Communion or the Lord’s Supper) is considered a sacrament, ordinance, or equivalent in most Christian denominations. Bread has symbolic roles in the Abrahamic religions of Judaism and Christianity. During the Jewish festival of Passover, only unleavened bread is eaten, in commemoration of the flight from slavery in Egypt. The Israelites did not have enough time to allow their bread to rise, and so ate only unleavened bread matzo. In the Christian ritual of the Eucharist, bread is eaten as a sacrament either as a symbolic representation of the body of Christ or, as in the Catholic liturgy, as a real manifestation of the body of Christ. Specific aspects of the ritual itself, including the composition of the bread, vary from denomination to denomination. The differences in the practice of the Eucharist stem from different descriptions and depictions of the Last Supper which provides the scriptural basis for the Eucharist. The Synoptic Gospels present the Last Supper as a Passover meal and suggest that the bread at the Last Supper would be unleavened. However, in the chronology in Gospel of John, the Last Supper occurred the day before Passover suggesting that the bread would be leavened. Despite this point of disagreement, the Council of Florence of the Catholic church agreed that “the body of Christ is truly confected in both unleavened and leavened wheat bread, and priests should confect the body of Christ in either”. Some traditions of Wicca and Neo-Paganism consume bread as part of their religious rituals, attaching varied symbolism to the act. Although eaten by nearly all people, some have rejected bread entirely or rejected types of bread that they consider unhealthy. Reasons for doing so have varied through history: whole grain bread has been criticized as being unrefined, and white bread as being unhealthfully processed; homemade bread has been deemed unsanitary, and factory-made bread regarded with suspicion for being adulterated. Amylophobia, literally "fear of starch", was a movement in the US during the 1920s and 1930s. In the United States, bread sales fell by 11.3% between 2008 and 2013. This statistic might reflect a change in the types of food from which Americans are getting their carbohydrates, but the trends are unclear because of the concurrent effects of the Great Recession. Bread market remains challenging. Food Business News, 17 September 2013  It is also possible that changing diet fashions affected the decrease in bread sales during that period. The ancient Egyptians used moldy bread to treat infections that arose from dirt in burn wounds. ^ "companion". Online Etymology Dictionary. ^ Beeton, Mrs (1861). Mrs Beeton's Book of Household Management (Facsimile edition, 1968 ed.). London: S.O. Beeton, 18 Bouverie St. E.C. p. 832. ISBN 0-224-61473-8. ^ Alan Davidson (21 August 2014). The Oxford Companion to Food. OUP Oxford. pp. 692–. ISBN 978-0-19-104072-6. ^ "Pinoy Tasty arrives". ABS-CBN News and Current Affairs. 6 October 2010. Retrieved 15 March 2011. ^ "Pinoy Tasty, generic bread, debuts at P36 per loaf". GMA News and Public Affairs. 5 October 2010. Retrieved 15 March 2011. ^ "Bread Makes the World Go Round". sixservings.org. 15 October 2010. Archived from the original on 14 January 2013. ^ "Bread and Salt Ceremony in Europe". cookatease.com. ^ Spary, Emma (2014). Feeding France: New Sciences of Food, 1760-1815. Cambridge University Press. p. 55–68. ISBN 9781107031050. ^ Chorleywood, the Bread that Changed Britain. BBC.co.uk (7 June 2011). Retrieved 21 March 2013. ^ La histopa del pan. Juntadeandalucia.es. Retrieved 21 March 2013. ^ "Largest bread consumption per capita". Guinness World Records. 1 January 2000. Retrieved 8 November 2015. ^ "Bread, which is loved, by our neighbors". grazione.ru. 6 July 2012. Archived from the original on 2 May 2013. ^ "El Tamiz: Bread, cheesecake and a bit of variety". foodychile.com. 14 February 2012. Archived from the original on 6 July 2012. Retrieved 19 December 2012. ^ M.F.K. Fisher, El arte de comer. ^ Ethiopian Injera Recipe | Exploratorium. Exploratorium.edu. Retrieved 21 March 2013. ^ "Egyptian Pita / Aish Baladi". breakurfast. Retrieved 11 February 2016. ^ "Egyptian Bread - 'Eesh baladi' - Egyptian Local Bread". www.ahmedhamdyeissa.com. Retrieved 11 February 2016. ^ Katz, Solomon. Charles Scribner's Sons, (Vol 3 ed.). New York: Gale. p. 531. ^ Hazen, Walter (1 September 2002). Inside Christianity. Lorenz Educational Press. Retrieved 3 April 2012. The Anglican Church in England uses the term Holy Communion. In the Roman Catholic Church, both terms are used. Most Protestant churches refer to the sacrament simply as communion or The Lord's Supper. Communion reenacts the Last Supper that Jesus ate with His disciples before He was arrested and crucified. ^ Albury, W. R.; Weisz, G. M. (2009). "Depicting the Bread of the Last Supper" (PDF). Journal of Religion and Society. 11: 1–17. This page was last edited on 6 March 2019, at 02:41 (UTC).